What’s the Best Way to Celebrate Colorado Craft Beer Week? With a Beer and a Hike in Golden, Colorado of Course! 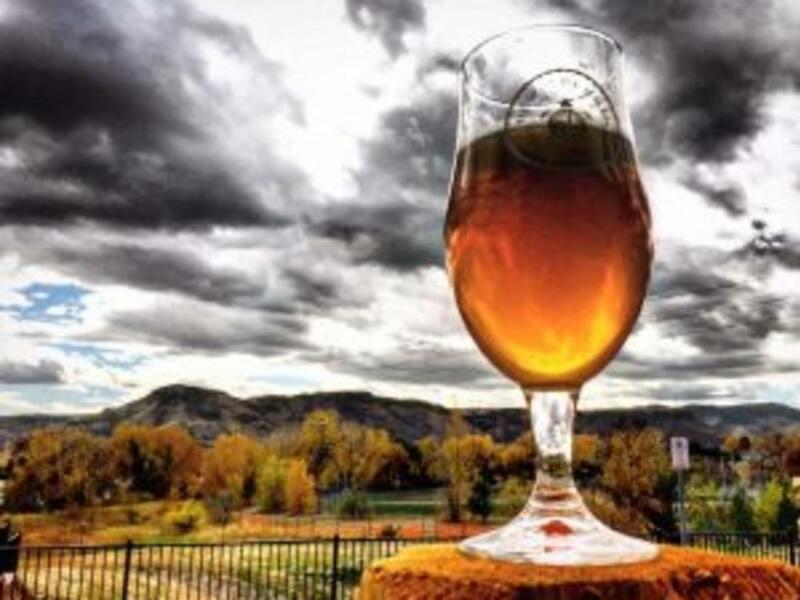 Colorado Craft Beer Week, March 31-April 7, 2018, is a celebration of all things beer, and nothing goes better with a cold pint than a hike through the Colorado countryside. Golden, the closest mountain town to Denver, is an area of spectacular natural beauty, surrounded by four mountain lookout points and hundreds of miles of trails. And of course, Golden is also home to six craft breweries, as well as Coors Brewery, the oldest brewery in the state and the largest in the world. And did you know that Coors also produces a rare craft beer, Barmen Pilsner, available at only 14 places, and several of them are in Golden? Here are six close low elevation hikes in Golden, paired with a wonderful victory Golden beer from a local Golden pub or brewery afterwards. 1. PEAKS TO PLAINS TRAIL: This easy, paved, all-weather bike and hiking trail follows Clear Creek for four miles, through some of the most dramatic parts of the canyon between Golden and Idaho Springs. Ultimately, the trail will extend all the way from Golden to the Eisenhower Tunnel – 65 miles. Today, you’ll see cliffs, wonderful views of the creek, rock climbers, and big horn sheep. A long part of the trail near Tunnel 4 cuts away from the highway, offering quiet solitude beside a mountain stream. The trail runs from the Big Easy Trailhead, just six miles east of Golden on Hwy. 6, to Tunnel No. 4., with parking and trail access also available at Mayhem Gulch. VICTORY BEER: What could be more appropriate than starting at Trailhead Taphouse & Kitchen? 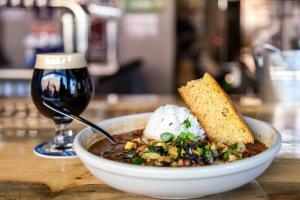 The owners of the Windy Saddle Café have another downtown eatery specializing in Cajun cooking with local beers from Renegade, Snowbank, Green Mountain Beer Co., Resolute, and Mockery, just to name a few. We recommend a Colorado Native from AC Golden, which is made from all local Colorado ingredients. For food, dig into jambalaya, crab & shrimp gumbo, blackened shrimp Po’ boys, and flatbread pizza. 2. THE ZORRO TRAIL/RED ROCKS LOOP: This can be a short loop filled with dinosaur prints and Jurassic period history, or can be a full day, up and down 7.5 mile hiking or biking loop through Red Rocks and Mathew Winters parks. Start on Rooney Rd. at the Green Mountain Trailhead, and you’ll discover why this is called the Zorro trail as it zig-zags up the mesa in a giant “Z.” You soon arrive at the Dakota Hogback Trail which, if you head south, takes you to Dinosaur Ridge. Trail signs tell you about the many dinosaur bones and footprints discovered here. You can head back down on old Alameda (a paved road now closed to traffic) to the Dinosaur Ridge Museum and then on to your trailhead, or make a giant loop on the Red Rocks Trail back to Mathew Winters, then up the ridge back to Zorro. VICTORY BEER: You’ll be seeing a lot of geology on this hike, so head to where the students from the Colorado School of Mines hang out, Golden City Brewery. The brewery was started in the backyard of two geologists, Charlie & Janine Sturdavant, and it’s still there. Buy a pint of their award winning English Northern Brown Ale in their old carriage house and enjoy it outdoors in their backyard. 3. 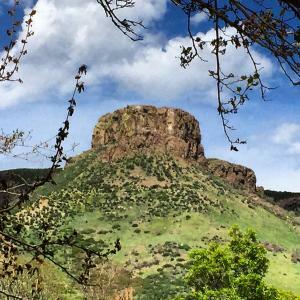 SOUTH TABLE MOUNTAIN: South Table Mountain’s Castle Rock has seen some history. For years, it was the high butte pictured in the Coors logo. There was once a roadhouse tavern on the top, reached by an inclined railroad. The fossilized bones of the first T-Rex dinosaur were discovered here, and Nike once tried to buy it and turn it into a huge corporate headquarters. That plan went away, and today, South Table Mountain and Castle Rock are gorgeous and wild, towering over Golden and offering the best view over the town. It’s a short steep climb, involving some scrambling, and switchbacks, but the effort is worth it. As with all Colorado hikes, bring plenty of water. VICTORY BEER: How often can you see the rock you just climbed from the outdoor deck of a bar? You can see Castle Rock from the Table Mountain Grill & Cantina. Known for its adobe décor and Southwestern food, the cantina has one of Golden’s happiest happy hours and is known for its drink local philosophy, serving a variety of craft beer and Colorado craft cocktails. 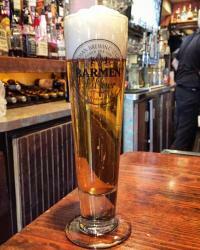 But the drink to get here is Barmen Pilsner. Named after Barmen, Germany, the birthplace of Adolph Herman Joseph Coors, the beer grew from Pete Coors’ desire to create an authentic German Pilsner, the type that takes seven minutes to pour. Only 20 barrels are brewed a month, and because it’s hard to find, it has achieved cult status. Each beer must be served in its own special glass and must be poured with the traditional foam-settle-foam-settle pour. It really does take seven minutes to achieve the perfect head. Which will give you plenty of time to get your phone ready – this beer is pretty enough to be in a picture. 4. THE ENCHANTED FOREST TRAIL. Start at the Lookout Mountain Nature Center on top of Lookout Mountain, where you can learn about the flowers, animals and geology of the region. Then head south and walk downhill into Apex Park on the less known and less well used Enchanted Forest Trail, which is quiet and peaceful and takes you through a thick evergreen forest to the bottom of the canyon. Of course, what goes down must go up. So you will have a steep climb back up the canyon, unless you’ve made this a two car hike and parked a second car at the Heritage Road Apex Park Trailhead, in which case it’s just a nice 4.4 mile forest stroll downhill. 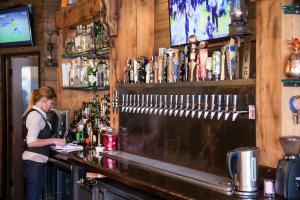 VICTORY BEER: With 24 taps and 50 bottled beers, Miners Saloon is the perfect place to celebrate Craft Beer Week. After all, they have a “Golden Tap” which rotates Golden beers from New Terrain, AC Golden, Mountain Toad and Golden City Brewery. The rustic and cozy interior with a lighted Onyx bar and two fireplaces is a modern day saloon reminiscent of Golden’s mining days in the late 1800s. Created by Chef John Wilson, much of the menu is house made, including venison, boar, and bison sausage, dips, sauces, ice creams, pickles, and ricotta cheese. 5. BEAVER BROOK & CHAVEZ LOOP: Located in Genesee Park, this is a more strenuous and difficult 5 mile loop hike with some water crossings and a few exposed cliff sections, but it’s worth the effort. Start at the trail just past the Buffalo Herd Overlook and hike down the Beaver Brook Trail into a narrow gulch. Some water crossings lead to the Chavez Trail, a steep climb up that ends with a half mile braille trail for blind hikers. Be sure to stop for photos of the buffalo herd, with more than two dozen bison kept here year-round. VICTORY BEER: The toughest hike deserves a tough choice of beer, and that’s what Barrels & Bottles Brewery provides. There are 27 craft beers on tap (a half dozen of their own and great guest beers from across the country) and 24 wine taps. They serve several Golden craft beers, including the gluten free Fat Randy IPA from Holidaily Brewing Co. A local’s tip: Stop by and say hi to the owner’s two dogs, Pixie and Oba. 6. NORTH TABLE MOUNTAIN: One of the two broad, flat-topped mesas hovering above Golden, this rocky desert-like area is ringed by cliffs with a half dozen hiking trails crisscrossing it. The classic hike is a moderate 5.9 mile loop trail that will take you around -- and over -- the mesa top, with 360 degree views of Golden, Denver and the Front Range. A parking area on Colorado Hwy. 93 just north of town has maps; trails head off clockwise, or counterclockwise around the mountain. Shorter hikes head straight up the mesa over a lunar landscape of rocks to the flat top, where you should be on the lookout for herds of deer. VICTORY BEER: Stop at nearby Cannonball Creek Brewery which has really racked up the accolades since it opened in 2013. We can’t think of a more perfect grand finale to your Golden hike than a Solid Gold Belgian Golden. This 2016 Great American Beer Festival Gold Medal Winner features an aroma of fresh tart lemons, balanced by a very subtle spice. You can kick back in your hiking boots and celebrate a perfect Golden day as you enjoy this delicious Golden ale! For more ideas on Golden activities, restaurants, hikes and fun, head to visitgolden.com. Cheers to Golden beers!